Sasha Steensen’s books are more lyric project than poetry collection. While many collections of poetry have themes that tie the poems together, Steensen’s books use their subject as a nexus around which the project grows, as if Steensen free-associated around the subject and developed individual pieces from there. 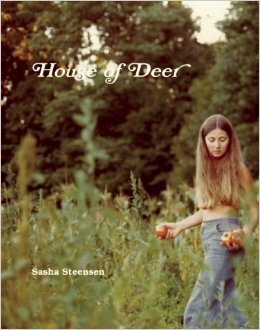 House of Deer, Steensen’s intricate and lovely third collection, centers on her back-to-the-land childhood. Like her second collection, The Method (Fence Books, 2008), Steensen blends research and personal history through a process of addition, subtraction, and associative swerves. House of Deer quotes, mentions, or makes references to Theresa Hak Kyung Cha, Gerard Manley Hopkins, George Oppen, and Baudelaire, among many others as a way to begin building (and it’s probable that this reader missed even more references). These connections are layered and reward repeated readings. The titular poem, “House of Deer,” mentions “the house on Hopkins Road,” where the reader assumes Steensen’s family lived; a later poem, “Fragments,” is noted as being written “after Hopkins.” This connection does not feel like an accident. Instead, let’s talk about your closet full of weed. If I could say sorry for that disclosure, I would. Too Anne Bradstreet for me. The Crane connection goes beyond a shared hometown. A “hart” is another term for a male deer; deer, like Crane’s life and work, serve as a way to enter into memory. Like deer, Steensen lived on the fringes—both of forest and mainstream culture—in a family unit that moved together: “sound of deer changing direction &then turning back,” as she writes in the section from which the book takes its name. Another section, “The Girl and the Deer,” is a retelling of a Zuni story. In it, Steensen tells “a story the writer cannot tell” of a girl, abandoned by her mother, being raised by a deer mother before her biological family kills her deer family and incorporates the girl back into their family. The intricate notice of sonic possibilities and meanings present here is found throughout the book adding a layer of complexity to the project that drives the reader forward. Though Steensen’s method of composition may be very modern, she enters into dialogue with her influences and poetic-godparents. The effect is a complex, self-referential text that is as rewarding as it is difficult, which is to say very. Readers that enjoy layered poetic narrative will find a favorite author in Sasha Steensen. What are your favorite “book projects,” as opposed to poetry collections?